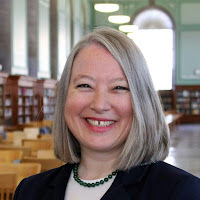 Today I am publishing the response I received from Lisa Janicke Hinchliffe, Professor/ Coordinator for Information Literacy Services and Instruction in the University Library and affiliate faculty in the School of Information Sciences at the University of Illinois at Urbana-Champaign. Lisa’s voice is interesting to have in this discussion not least because, as she says below, she has not followed all the details of the open access debate as it has played out over the past 15 years. Nor was she familiar with the wording of the BOAI, and indeed she was surprised to see the recommendation it makes on copyright. So Lisa approaches the BOAI with fresh eyes. When Richard invited me to contribute to this series, I had to pause for a moment and ask myself “just what was the Budapest Open Access Initiative vision?” I’m glad I stopped to check because, like many others have discovered, my impression of what it says is not exactly what it does say. The paragraph Richard quotes above is what I am taking as the essence of the vision and thus the focus of my reflections, which runs the risk of ignoring 15 years of discussions and resulting statements. But, I think there is value in being anchored in this vision, which is necessarily reflective of the circumstances within which it was created, but is also audacious – as a vision should be – and timelessly compelling in many ways. I think it is also important to recognize what the vision does not include – most specifically, regardless of what some might wish, the BOAI does not call for the removal of for-profit actors from the system. For each group that Richard presented to me, I am going to identify one or two specific strategies that could be deployed to move the system closer to the BOAI vision. In my thinking, I’m suggesting widespread deployment – in most cases there are examples for the strategy I’m recommending that are underway. Also, there are many more tactical activities that I am not mentioning in the interests of challenging myself to think about catalytic or accelerative impact and not only incremental change. All of my recommended strategies likely come at a cost, in many cases potentially significant and I suspect in some cases unbearable. In many ways that is the challenge in achieving the BOAI vision – not whether the vision is desirable but what we are willing to sacrifice in order to achieve it. One other note before I begin. I do not take as a given that all of the groups, or individuals within the groups, mentioned below want to realize the BOAI vision, particularly with respect to the last sentence about copyright. Given current copyright regimes, researchers are by and large uniquely positioned as the initial decision makers around how to steward the intellectual property that comprises the scholarly literature. As the owners, they decide. They decide within a system of constraints, reward systems, etc. (many of which could be more hospitable to open access but I will get to that in a moment). But, they decide. Now, in fairness, it is true that funding agencies do constrain researcher choice in many cases as a condition of the funding. To my knowledge, though, none of them are demanding closed publication so acknowledging that fact does not counter the recommendation that authors faced with the option of choosing closed should choose open if they want to further open access. Perhaps this was seen as a more palatable recommendation than the alternatives. Nonetheless, if researchers would instead apply a CC-BY-SA license to their work, they could leverage their decisions to open their own work into pressure on others to do so as well. Given the BOAI goal of eliminating financial barriers to access, a CC-BY-NC-SA license would create further pressure within the system by preventing enclosure inside systems that create financial barriers. Given applying a CC license does not preclude others exercising fair use rights (e.g., to cite a direct quotation in a future text) and does not prevent a rights holder from granting uses of their work that fall outside of the CC license, applying a CC-BY-SA or CC-BY-SA-NC enables a researcher to set a default of the strongest possible encouragement of open access while also protecting their own interests in enabling other uses if they chose. It is worth noting here that researchers have the opportunity to exert influence collectively through their scholarly societies as well. Creating a culture of open access within a discipline can be leveraged for institutional change as well as serve as justification for individual choices and actions. Research institutions establish the reward systems in which researchers work. This one is pretty simple. If institutions want researchers to publish their work open access, reward them for doing so. This means in annual review, tenure, and promotion processes of course but not exclusively. It also means with respect to internal grants, access to support resources for applying for external funding, etc. More radical would be to also “punish” those who do not publish their work open access. I’m less clear the best approach for how this might be operationalized. One could imagine a system that at least demands a justification for closed publications that are reported in an annual performance review process as well as detailed documentation on what steps were pursued in an attempt to make them open. Switching the default from closed to open, meaning that closed must be justified rather than open, would be a significant cultural shift in many settings. Across Europe one sees an emphasis on repository deposit in performance and promotion reviews, with the most fully developed example being the UK’s HEFCE [Higher Education Funding Council for England]. HEFCE requires deposit in an institutional or subject repository for considering in the REF and REF engagement is tied to both individual employment and university support for departments. It is worth noting though that this HEFCE requirement only extends to read, download, and search and not the full BOAI definition of open access. The challenge for many research institutions will be executing this strategy without damaging their institutional initiatives to pursue ranking, stature, prestige, etc. One potential approach would be to align rewards and support for open access with those activities that also support institutional excellence initiatives. For example, rather than providing funding for APC fees for publications in any open access journals a researcher might publish in, an institution could direct such funding to the top ranked open access journals. My focus here is on research intensive universities because they have the clout and influence necessary to shift the system. This is not to ignore that research occurs at other kinds of institutions but to recognize that systemic change requires strategic consideration of which groups are the actors with power. Research funders make the rules for the funding they award. If they want researchers to publish the work that results from the funding as open access, they should require it, reward it, and monitor for compliance. That is the simple answer. Research funders, however, are positioned to have a much greater impact by also attending to ensuring that open infrastructures are developed and sustainable. While some attention has been paid to open repositories for text materials, open infrastructure, particularly with respect to preservation and long-term access, for data, media, etc. is still nascent. In some ways, government information has been an exemplar of a kind of open access. I am of course most familiar with the government information policies in the United States. While I do have concerns about some of the privatization of government information that seems to be occurring, the government documents depositories of print materials and now Internet-based access to e-documents reflect the BOAI vision of open access – free to read, use, etc. all without copyright limitations or additional financial barriers. Extending these practices to all publications that result from federal funding would expand open access and the framework for conceptualizing government information and the public domain. Politicians and governments should take pride in openness to government information and allocate funding and other resources necessary to ensure that government information collections are leading the way as models for open access, including long-term preservation. Librarians need to start doing all of the things that they want researchers to do. Full stop. Librarian credibility as advocates for open access is undermined when a quick review reveals that there are too many cases where the situation is “do as I say not as I do.” This applies at the individual level (e.g., depositing author manuscripts in an institutional repository) as well as at the collective (e.g., tenure and promotion guidelines within the library, an open access deposit mandate for librarians if a campus does not have one or if the campus one does not cover librarians because the librarians are staff and not faculty, or internal grants to cover APCs for librarians). Second, librarians need to consolidate and focus their efforts. Pilot projects, experiments, etc. can bring many benefits but I’m worried that librarians are wearing themselves out with all of the activities they have going on. We are very busy, but the strategic impact isn’t commensurate to the effort. The 2.5% Commitment proposal and resulting initiative are examples of the kind of focused effort I mean; however, investments will have to be far more radical than such a minimal amount to be powerful enough to create the paradigm shift that is envisioned in BOAI. For-profit publishers with Gold open access offerings funded through APC fees have in many ways been the greatest contributors to the increased number of peer-reviewed scholarly articles available for open reading, copying, etc. There are also interesting experiments and emerging models in the non-profit sector; however, capital remains a challenge for investing in necessarily platform developments and workflow technologies. Interestingly, I think publishers are more hopeful for – or at least resigned to – a kind of open access than librarians and researchers are. Many publishers freely observe in more casual moments that a world of openly available copies of all texts is inevitable and that the only question is whether the copies are licit or illicit (e.g., see Sci-Hub and ResearchGate). Their focus is on limiting the illicit and finding sustainable – and profitable – business models for licit. As such, I think the greatest contribution that publishers can make to the BOAI vision is to solidify funding models that will accelerate the transformation they see as already underway and inevitable. Moving out of the current situation of libraries paying for subscriptions to journals that include open access content (though publishers are quick to assert that the payment is only for closed content and that they do not double dip) would achieve the BOAI vision and create a more competitive market for setting APCs. Let me answer that question very directly. First, I would be rightly accused of being fanciful if I suggested that a for-profit should act as if it is not a for-profit. Second, and very directly relevant to this essay, the BOAI vision includes a role for for-profit publishers and what I agreed to write about was realizing the BOAI vision. As such, I constrained myself to focus on how the vision could be achieved rather than critiquing it. Admittedly, however, the BOAI did assert that “the significantly lower overall cost of dissemination is a reason to be confident that the goal is attainable and not merely preferable or utopian.” It appears now that that confidence may have been misplaced. Cost was not equal to price in the subscription model and even non-profit publishers need revenues beyond costs in order to invest in continued platform development and business growth. Within that reality, open access, at least with respect to reading and downloading, has made great strides since the BOAI vision was articulated. But, as visionary as the BOAI was, it appears to have been too hopeful with respect to how pricing and profit would play out. The response I received to these questions from Danny Kingsley, Deputy Director of Scholarly Communication, and Head of the Office of Scholarly Communication, at Cambridge University, is available here.